This post is part of a series on the fourth day of my Holiday in Seoul, Korea. 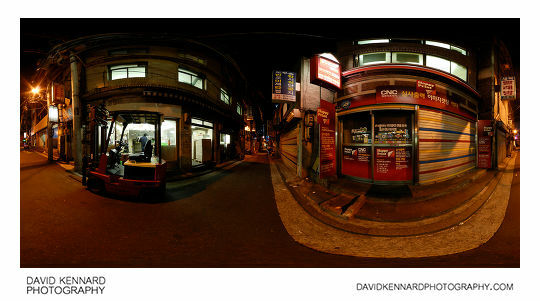 If you haven't read the first part, that's here: Korea Day 4 Part 1 - Seoul Metro. After having rested up at the hotel for a while, we went out in the evening to try and find Namdaemun (남대문), a large and famous gate that used to be the southern gate of Seoul. Unfortunately, we didn't realise that it had been burned down in February 2008. So while we did find Namdaemun eventually, it was surrounded by boards and scaffolding. Still, we had a nice walk to that gate, and I took a few panoramas on our walk. I was shooting at ISO100, so this required quite a long shutter speed. Bracketing my shots would have required 3x as long for each shot, so I didn't bracket my shots at all. This means that some areas like signs and inside shops are quite overexposed, but I can live with that. 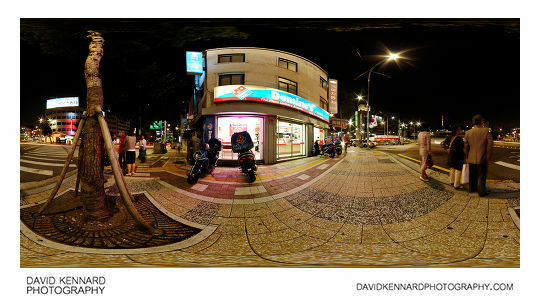 I also didn't take handheld nadir shots for most of these night time panoramas, which meant I had to spend quite a while in Photoshop on each one manually cloning, copying, pasting, and warping to try and remove the tripod, the tripod shadow, and my shadow from the images. The Myeong-dong area of Seoul is very popular with young people, with a lot of shops and restuarants. The below panorama was taken outside the Migliore department store. You can see there are also lots of street sellers around, mainly selling clothes and accessories. 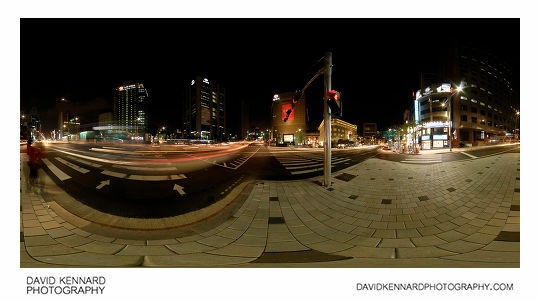 I took another panorama by the intersection of two large roads, Toegyero (퇴계로) and Banpo-ro (반포로), and tried to capture the light trails of the traffic as it passed. 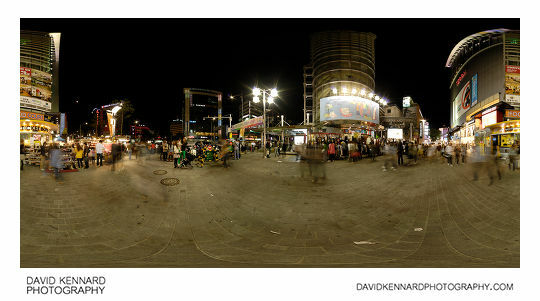 Getting nearer Namdaemun, we entered Namdaemun Market at Gate 6, where I took another panorama. 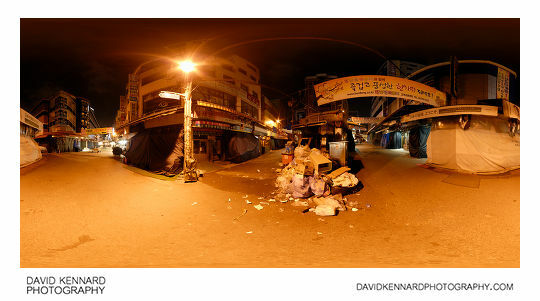 The streets of Namdaemun market tend to be a mixture of shops and market stalls, and the market sellers don't shut up shop until about 9.30pm. 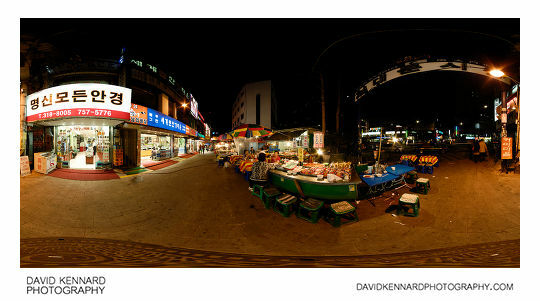 Further into Namdaemun market I took another panorama. 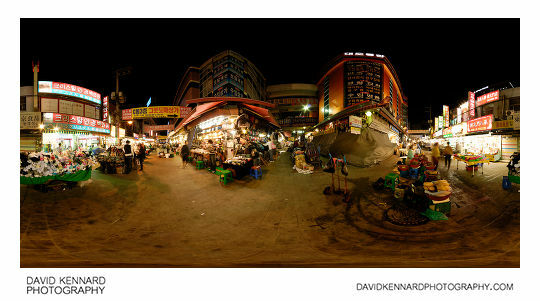 I try to take my panoramas with an object in the foreground reasonably close to the camera, to avoid a large space in the bottom half of the image. However, in busy places this is not always possible since I don't want to get in people's way. After finding Namdaemun, and seeing that it was closed and under repair, we came back through Namdaemun market again. We didn't come back through the exact same route (Namdaemun market is quite large), and found that most of the shops were now closed. Generally Seoul is very clean and litter free, but we came across a large pile of rubbish, presumably left behind by some of the market sellers. The rubbish has been piled together nicely rather than strewn across the street, and I expect it would all be taken away by the next morning. When we got back near the hotel, I was surprised to see a printers still working at 10.15pm. Especially since these shops seem to open early in the morning, around 7am I think. I'm not sure if the same person would work a single shift all day, but it wouldn't surprise me much if they did.